Almost 6,000 extra tickets to watch all of Wales' home World Cup qualifying matches have been bought in 48 hours. The final batch of tickets to watch Chris Coleman's side try to secure qualification to the tournament in Russia in 2018 went on sale on Tuesday. As of Monday, 10,000 tournament tickets - which cover all five qualifiers - had gone. That number is now nearly 16,000. Wales face Moldova, Georgia, Serbia, Austria and Republic of Ireland with all games held at Cardiff City Stadium. The first qualifying match is against Moldova on 5 September at the 33,280-capacity stadium. 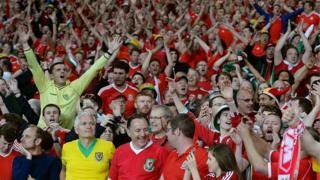 In comparison, the Football Association of Wales sold 12,400 tournament tickets for the Euro 2016 qualifying campaign. Coleman has already said the 2018 campaign will be his last as Wales boss - whether or not his team qualify. Tickets have been sold to club members in four staggered sales according to membership eligibility but are not on sale to the general public.